Paradise of the Pacific : Surf Riding Tourism, 1905. Volume 18 Number 3, pages 15-17. 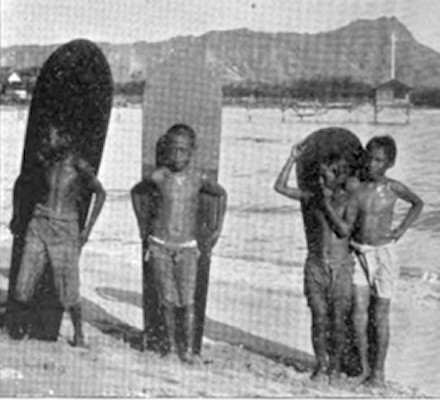 The board portrait of four boys at Waikiki was published earlier in Paradise of the Pacific, February 1904, Volume 17 Number 2, page 17.
a rate of fare that startles the hackmen who retired from business after the monarchy times. The drives through the Islands is practically eclipsed by civilization they look for a few relics of the life of the early Hawaiians. Native color, whether it be the ﬁrst fashion of horseback riding, surfboard or canoe riding, shark ﬁshing, the luau or the hula - something never seen in California or any other part of the mainland - is what the pleasure seeker likes to have imbued in his entertainment. Surf riding and canoe riding are sports of the most thrilling character. To carry out the former it would be necessary to bring here some young men of the other islands who still practice the play of their forefathers. They swim from the beach to a point beyond the breakers with long, heavy koa boards and then, standing erect on their simple rafts, shoot through the surf to land. Canoe riding is enjoyed by a party of four with two skillful natives to manage the craft, which has an outrigger to render safety doubly sure. Down and over the lofty billows the canoe rides from sea to shore, a sort of fun that gains popularity by frequent trials. Proprietors of beach resorts are always willing to lend their assistance in organizing canoe sports. Keep the tourist moving and show him something new every day. He has a long purse and is usually willing to pay well for what pleases him. Give him good amusement six days of the week and he won't care whether Sunday keeps or not. Geoff Cater (2016) : Paradise of the Pacific : Surf Riding Tourism, 1905.